Without a doubt, my greatest fear when we hit the road full-time in our travel trailer (without a trailer backup camera) was simply this: Complete and Utter Destruction. Unreasonable, you say? Let me explain. I was a complete newbie to all of the following: RVing, truck ownership, trailer towing, trailer backing…you get the idea. So you can imagine that the thought of backing my 30-foot travel trailer into unfamiliar and tight spaces around the continent caused me to break out in a cold sweat. Not to mention just maneuvering it through tight city streets and busy highways. But my fears and safety concerns didn’t stop there. Let’s talk all about the benefits of a trailer backup camera and several other travel trailer safety products you may be considering at this point in your RVing journey. Looking back on our 17 months of travel around the continent, I don’t have many regrets. But I do recognize a few things that I would have done differently knowing what I know now. 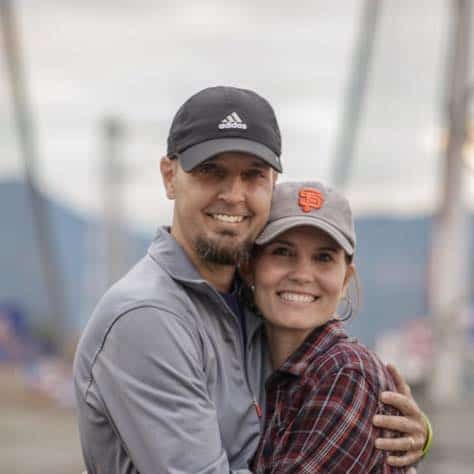 Some of those things relate more to our style and pace of travel as I cover in #1 of this advice post for new full-time RVers. But when it comes to safety and peace of mind considerations, my first thought is about increased visibility. 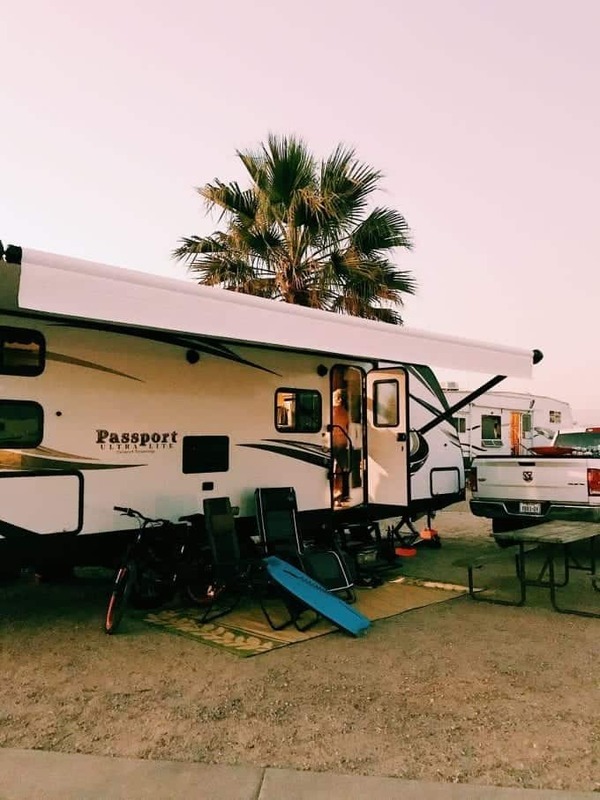 Now here was my situation with my travel trailer: We bought it brand new in 2017 so it came equipped with some great features that were important to us, including an enclosed underbelly, outdoor kitchen, outdoor speakers, etc. And it even had a spot on the back of the travel trailer to install a backup camera. So it was wired for it, ready to go, and would have been pretty much a plug and play situation. I had one feature included in my travels that kept me from making this purchase: two teenage boys. At every point that I was required to back that trailer for any distance, they would each be stationed behind the trailer to watch their respective corner and ensure I steered clear of any and all hazards. Even with my boys as my “safety products”, I was tempted more than once during our travels to spend the $300+ dollars on that Furrion backup camera as added protection. If my boys had not been there to guide me, I would have gladly dropped that $300 in a heartbeat for added safety and peace of mind. If your travel trailer did not come with a pre-installed location for a trailer backup camera, there are plenty of wireless backup camera options on the market as well that will give you the same level of safety. And overall, they are less expensive than the Furrion option that I had. Take it from me and my 17 months of travel trailer experience on the road: You will not regret this safety product purchase. You might be saying, “Huh?” This isn’t technically a “travel trailer safety product”, I get it. At the same time, I simply cannot discuss travel trailer safety in any depth without discussing the massive issue of travel trailer tires. I won’t try to cover all of the details of this topic in this post, because I discussed it in great detail in this post about travel trailer tires. From my research, it seems that the vast majority of pull-behind RVs come equipped from the factory with tires that are incapable of supporting the full stated cargo capacity. And if you don’t pay attention to these numbers and make the required changes for your travels, you are in for a whole lot of nothing good. After doing my homework, I spent $600 to replace the Trailer King tires with D-rated Goodyear Endurance tires on my brand new travel trailer before we hit the road. The result? Tens of thousands of miles of exploration without a single tire incident. Ask me if I think it was worth it! All of that research I mentioned above related to my travel trailer tires convinced me to spend money on one other tire-related product: a quality Tire Pressure Monitoring System similar to this. I mean seriously, if I was going to spend that extra money on new tires then I also wanted to do whatever I could to keep them in good shape for as long as possible. And in addition to keeping you safe on the road by helping you avoid blowouts, a TPMS will extend the life of your tires if you pay attention to what it’s telling you. A TPMS will alarm when there are sudden or significant changes in tire pressure or temperature, the precursors to tire failure (such as a blowout). We had very few problems with the TireMinder TPMS system that we purchased and I rank it right up there next to the Goodyear tires as one of the best investments I made in our travels. It helped to keep us traveling and not stuck along the side of the road! Now you should know that this safety product applies only to travel trailers, just in case you are as green as I was coming into the RV world. In my experience, a weight distribution hitch is an absolute no-brainer that has completely revolutionized the business of towing trailers. It has introduced a margin of safety and control into what used to be far a far too stressful situation. A weight distribution system helps to ensure a smooth, level ride and allows you to tow to the maximum capacity allowed by your hitch. It also helps to correct tow vehicle sag, improve steering and stopping, and – when used with sway control – correct trailer sway. If you’re similar to me, you may have a hard time choking down a price tag like that. It is not a cheap safety product, especially if you choose to have it professionally installed as I did. Because of the retail cost and my desire to have it professionally installed, I ended up purchasing a very lightly used Equal-i-zer hitch from a private party in my area for about half the cost. After professional installation, my cost was fairly close to the retail cost of this weight distribution system. The route that you choose to go is completely up to you, but I highly encourage you to think long and hard before deciding to opt out of this safety product for your travel trailer towing. The difference in the towing experience is astounding, I guarantee you that, especially if you are towing for long distances or in windy conditions. One last word on the topic of weight distribution hitches: After watching the experiences of others and having multiple conversations with travel trailer owners, I strongly encourage you to stay away from hitches that involve chains instead of simply bars. The overall user experience and product satisfaction seems to be much lower with products that involve chains. (Not to mention that I’ve heard more than once about incidents where those chains nearly caused serious injury during installation.) For ease of use and reduced risk of injury, go for the bars. And for my dollar, you can’t do better than Equal-i-zer. I installed these on my travel trailer (you can watch my installation video here) and was instantly thankful I did. A simple way to keep your hitch components off of the ground, protecting both the components and your back! Check them out. Those weight distribution hitches are NOT light. Using this grip tool, along with the off-the-ground storage system above, is an ideal way to manage everything and keep yourself safe in the process. Go take a closer look! Confession time: I probably went FAR too cheap on this safety item for our extensive travels and our extended absences from the travel trailer. Just to have something in place after purchasing the trailer, I purchased this coupler lock from a local Home Depot. What can I say, I was feeling exceptionally cheap that day! But I had (indefinite) plans to replace that lock with something more substantial…at some point in the future. Well that never happened. No excuses. I guess I just didn’t find it as pressing of a safety and security issue as those I’ve discussed above where I spent PLENTY of money. But I can say with absolute confidence and honesty that on my next round of RV travels, I will opt for something much more like this coupler lock for added peace of mind. After all, when it’s your home on wheels, it deserves better protection than what I offered. My travel trailer may never forgive me. When I was shopping (for what seemed like an eternity) for a truck suitable for towing our new home on wheels, one feature that was “nearly” non-negotiable was a trailer brake controller. I knew that it was possible to add an aftermarket trailer brake control, but I just didn’t feel inclined to mess with it. I wanted it included as a factory component. Since I eventually decided to look exclusively at 3/4 ton trucks to handle our 5,000 pound trailer, this was not a major issue. Trailer brake controllers are pretty standard equipment on trucks of that size that are often used for towing large loads. But if I had settled for a truck that was not equipped with this component for some reason, you can bet I would have been on Amazon the next day to locate the best trailer brake controller for my money. If you will be towing with a vehicle that is not equipped with this feature, I suggest that you look into aftermarket installation of a trailer brake control. And especially if you choose to tow without a weight distribution hitch, make this safety product a priority for your travels. Because we were traveling so extensively, I chose what some might consider “overkill” by having the weight distribution hitch and trailer brake control. Honestly, there were only a handful of times that I felt the need to use that trailer brake control. But just for those times, it was worth it for me. 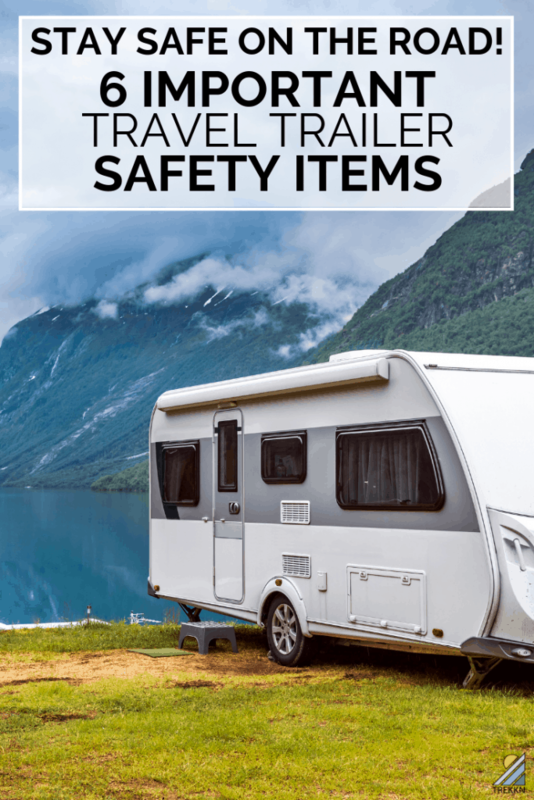 Which Travel Trailer Safety Products Would You Add to This List? Listen, we are bound and determined to get back out on the road for some extensive RV traveling again in the future. Instead of the matter of weeks we had to get educated and up to speed for our first RV adventure, I now have months that I can soak it all in and be 100% prepared for our next round. I want to take advantage of that time by hearing from you on this topic of Travel Trailer Safety. If you have any other items you feel should be added to this list, then please comment below and let me know! I am more than willing to add additional products to this post if I feel that it will help ensure the safety of our readers. Share away!